We are happy to announce that we now stock EZ Cover temporary concrete protection in our warehouse. This allows to more quickly ship EZ Cover to our customers nationwide. Whereas EZ Cover used to be shipped direct from the factory via freight, it can now ship same-day via UPS, getting it to your jobsite quicker than ever. EZ Cover is the leading breathable concrete surface protection for newly-laid and curing concrete slabs. EZ Cover doesn’t trap vapors onto the surface of new concrete slabs, allowing them to cure perfectly, cleanly, and while protected from damage. Because EZ Cover is breathable, it is the ideal surface protection for freshly poured slabs, decorative slabs, and other high end and interior concrete work. EZ Cover remains in place on concrete, terrazzo, marble, and hardwood due to its composition. It features a soft bottom layer under a hard and impact resistant top layer. This soft bottom layer holds EZ Cover in place, greatly reducing the time and tape needed to secure surface protection. 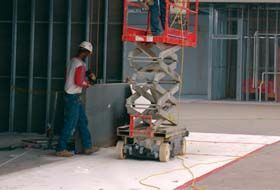 The strong top layer prevents equipment such as scissor lifts and dropped tools from damaging concrete slabs. EZ Cover is sold in 4′ x 50′ rolls and can be easily cut down to size by the user if needed. Each 200sqft roll of EZ Cover is $144.50. This entry was posted in Exciting New Products, Floor Protection and tagged concrete protection, EZ Cover, new product by admin. Bookmark the permalink.